Think opening scene of Leo Dicaprio’s movie The Beach. 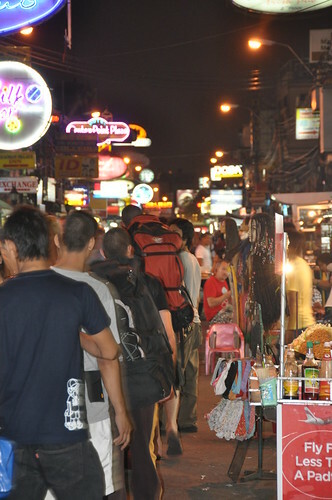 The eastern gateway of the western world, Bangkok’s Khaosan Road needs no further introduction. It’s the meeting point and the starting point of every backpacker. In here you can find the cheapest accommodation and liveliest night life. It’s walking distance from the Ratchadamnoen Stadium where we watched Muay Thai match and we almost did (walking, i mean). 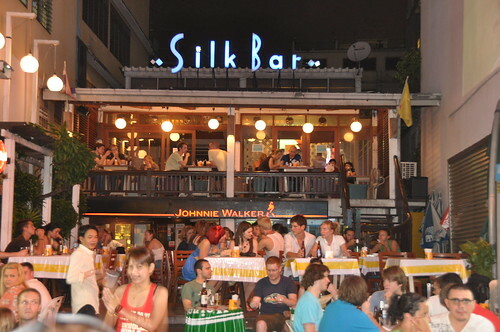 It was Sunday and at 9pm the city is almost quiet, that’s it until you get to the tip of Khaosan Road. We were quite hungry but were immediately charged with a new wave of energy upon coming here. It’s unfortunate that I listened to some forum postings that Khaosan is too noisy that I booked accommodation at the other end of town. Pincky and Chikara are from vibrant Tokyo, Girlie and I are from chaotic Manila, we immediately felt at home here. We wouldn’t have our problem of finding place to eat if we have stayed in this area. 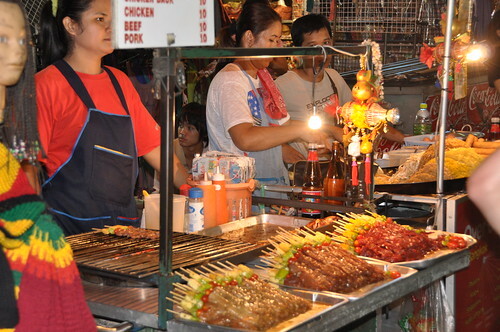 We were night owls and often come back to hotel late and craving for eats and nowhere to go around Langsuan. Because of it’s popularity, the area has become more than ever, a one stop shop for travelers. It is here where you can find the cheapest accommodations, a lot(!) 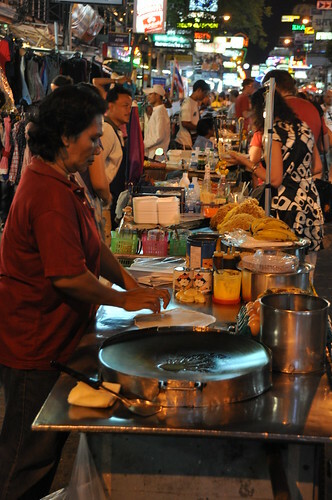 of them to choose from, plenty of food hawkers, restaurants, bars, internet cafes, tattoo & piercing shops, street spectacle, travel agencies, thai massage that costs 180baht (standard @250baht), and our collectively favorite activity, shopping. Greenhills and 168 are nothing compared to here. I was in Hong Kong in December 2008 and the ladies market in Mongkok has lost it’s luster. 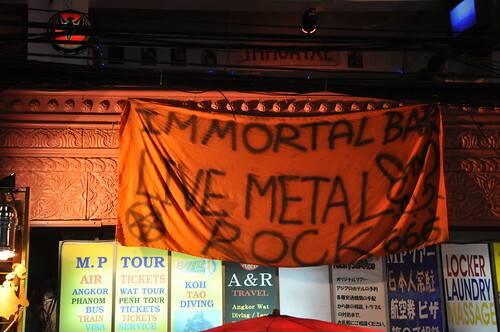 The Khaosan Road is shorter compared to the Mongkok Ladies Market, but it has more unique stuff to offer. In HK as with Phil bazaar, the items of every shop are identical. I’m so sick of faux Louis Vuitton and Gucci bags. In here, if you see something you like, you buy it because you will not find it in the next store. As women can live in shopping alone, we momentarily forgotten our hunger and feasted our eyes, ears, and other senses as we traverse along this colorful avenue. 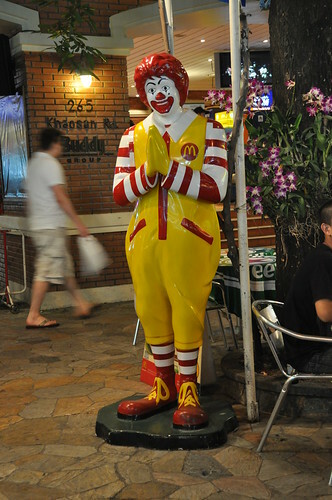 i love how ronald mcdonald has his hands clasped together, so unamerican! hehe. thanks for joining miss igorota’s blogoversary giveaway!